NOAA Researcher's Ashes Were Dropped Into The Eye Of Hurricane Michael NOAA researcher Michael Black pioneered the use of dropwindsondes — small measuring devices dropped into hurricanes to gather data. That data has dramatically improved hurricane forecasting. 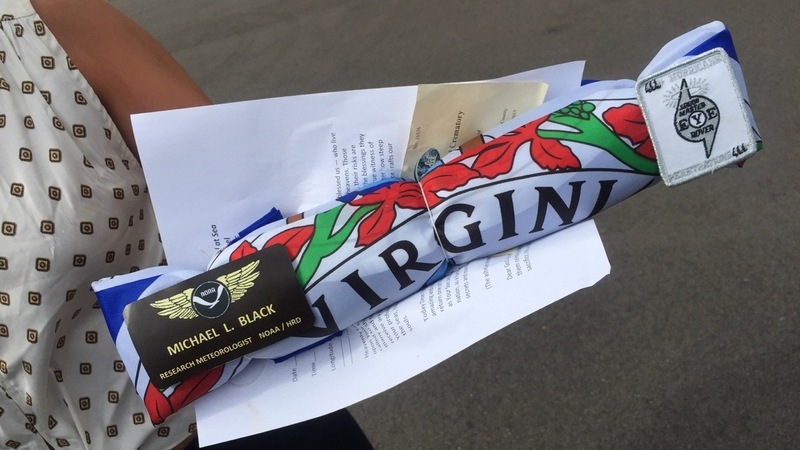 Researcher Michael Black's ashes were wrapped in the Virginia state flag before being dropped into the eye of Hurricane Michael. Black helped pioneer the use of a device dropped into hurricanes to measure wind speed and air pressure. Last fall, as Hurricane Michael was swirling toward the Florida panhandle, NOAA officials say it was carrying something in addition to rain and wind — the ashes of long-time hurricane researcher, Michael Black. Black was a research meteorologist who worked at the Hurricane Research Division of NOAA's Atlantic Oceanographic and Meteorological Laboratory on Virginia Key, just across the bridge from downtown Miami. NOAA research meteorologist Stan Goldenberg, who worked with Michael Black for more than two decades, recalls that flight with Black 21 years ago: "I remember the excitement we felt at seeing these winds and knowing these 'sondes' could handle it." Black's idea suddenly provided hurricane researchers with an important new data tool. Now, more than a thousand dropwindsondes are released into hurricanes every year, providing reams of data to be uploaded into computer models that forecast a storm's track and intensity. Goldenberg says this data has vastly improved forecasts, reducing errors in projecting the tracks of hurricane by 20 to 25 percent. "It's hard to imagine what hurricane science, forecasting and everything would be like right now without the dropwindsonde data," he says. "It's that important." Michael Black worked at the Hurricane Research Division until he died unexpectedly in 2017 of heart failure. At the time, he had gone on more than 400 flights through hurricanes. Knowing his dedication to hurricane science, after he died Black's children asked a rare honor for their father — that his ashes be scattered in a hurricane. Goldenberg says this has been done before for some other members of the tight-knit hurricane research community. "There are certain select people that have had the honor," he says. "It's like a 21 gun salute for us." Then, it was the question of finding the right hurricane and the right flight. That moment came in October of last year, as a new hurricane — serendipitously one that shared Michael's name — spun up in the Gulf of Mexico. Black's daughter carried his ashes onto a hurricane hunter flight, along with a crew of researchers ready to drop dozens of the dropwindsondes he helped pioneer. 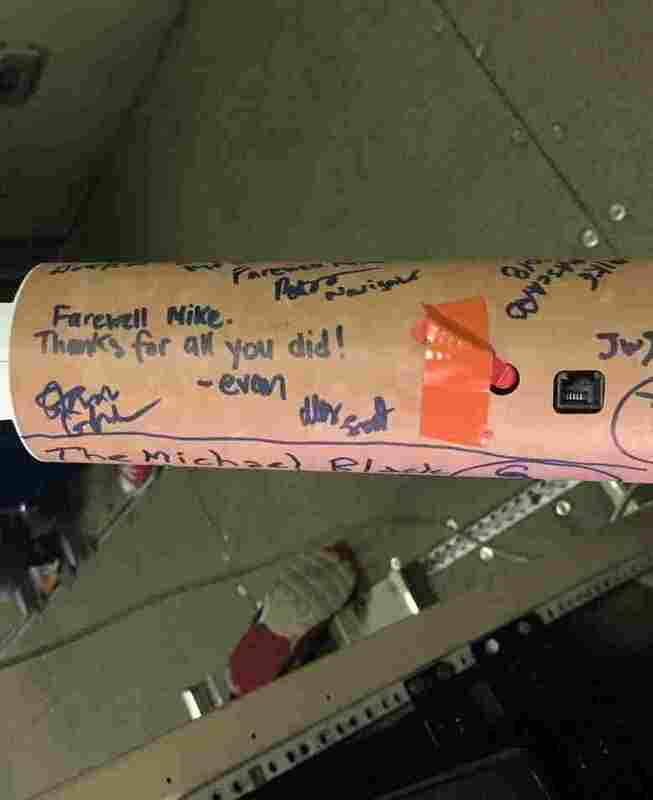 Crew members wrote messages of friendship and farewell on a special dropwindsende released as a memorial to Black. After a few passes through the hurricane, the crew held a brief ceremony. Then, Black's ashes, wrapped in the flag of his home state Virginia, were dropped through the aircraft's chute into the eyewall of Hurricane Michael. Goldenberg thinks his friend and colleague would have approved, for a few reasons. "Number one," he says, "it was into Hurricane Michael. Number two, you can say his ashes went out as a dropsonde — in the dropsonde chute." Black's friends and family also released a functioning dropsonde in Black's honor, one signed with messages of friendship and farewell.